Everything a heating & cooling contractor comes into contact with on a daily basis requires a tune up from time to time. Although you’re fully aware of this as a business leader, many of your customers may find themselves letting the maintenance of their household items fall to the bottom of their to-do list when life gets busy. By sending simple tune up reminder postcards to your clientele, you’ll put yourself on the top of their task lists, and your name will be the first thing they think of. Lead generation. Included a personalized URL the customer can visit to schedule their appointment, or let you know of any other product or service they need. An eye-catching headline. A first glance is imperative to getting your audience to read the rest of your information. Explain what you are offering in a short, sweet phrase that will get their attention. This valuable postcard real estate should be reserved for an attention-getting headline. Don’t waste this space on your company information; that can come later. Benefits. 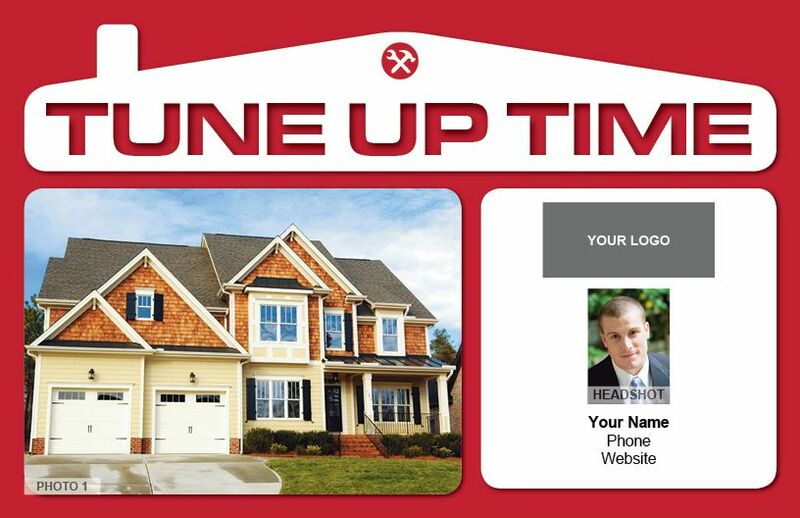 Utilize the power of bullet points on your tune up reminder postcards to give your message optimal readability. Explain the benefits of seasonal maintenance, and include the costs your customers could incur if they neglect to maintenance their homes properly. Your offer. Your tune up reminder postcards should include the offer you are trying to promote, along with the discount or special package pricing that’s available to customers. Great graphics. People are accustomed to tossing out junk mail, so it’s important to stand out from the crowd. Great graphics and a photo that supports your message can mean the difference between the trash can and a call for an appointment. Call to action. Suggest that your customers contact you, and include your company’s name, website, phone number, and other important information. Check out these awesome examples of tune up postcard designs here. Have you perfected your tune up reminder postcards? Please share what works and what doesn’t!